World AIDS day is observed on December first each year around the world. Since it's first observance in 1988 World AIDS Day has served to raise awareness about the epidemic, honor those who have died, focus attention on issues that are key to a successful response, and inspire positive action. With 33 million people living with HIV around the globe and a staggering 7,397 newly infected every day, the AIDS pandemic is no closer to being resolved nearly three decades since its first official recognition in 1981. 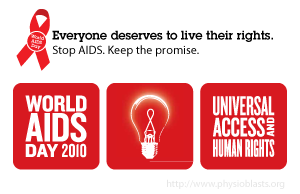 The World AIDS Day theme for 2009-2010 is "Universal Access and Human Rights". To emphasize the importance of human rights in the response to AIDS, UN Secretary-General Ban Ki-moon has reported to the UN General Assembly that reduced access to essential HIV information, prevention tools, treatments, and services is occurring in many countries as a result of laws and policies that are inconsistent with their commitments to human rights. He stressed that where human rights are promoted to protect people living with HIV and members of other vulnerable groups, there are fewer infections, less demand for antiretroviral treatment in addition to fewer deaths. In 2009, there were an estimated 2.6 million people who became newly infected with HIV. This is nearly one fifth (19%) fewer than the 3.1 million people newly infected in 1999, and more than one fifth (21%) fewer than the estimated 3.2 million in 1997, the year in which annual new infections peaked. In 33 countries, the HIV incidence has fallen by more than 25% between 2001 and 2009; 22 of these countries are in sub-Saharan Africa. This trend reflects a combination of factors, including the impact of HIV prevention efforts and the natural course of HIV epidemics.